Tim Hoftiezer, Owner practices as a Dentist in Carmel, IN. Services Tim Hoftiezer, Owner is a dentist/dental office located in Carmel, IN. 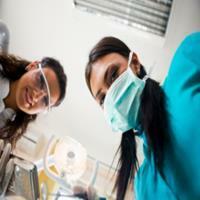 A dentist is trained to diagnose, treat, and prevent diseases of the gums, teeth, and jaw. Please call Tim Hoftiezer, Owner at (317) 705-5800 to schedule an appointment in Carmel, IN or get more information. They made the extra effort to make sure every question and concern I had was addressed. They were by far one of the best I've ever seen in their field. It was obvious that they've been exceeding their clients' expectations for many years. I really admire them for being more than willing to ask for help from other professionals in the field when they don't have an answer to my question. They aren't even slightly arrogant, and I'm confident they always have my best interest at heart. I know that I can trust their motives, and they're not just looking to make money off me. I never have to worry about them pressuring me to get dental procedures I don't need. If referred to this dentist RUN, don't walk, but RUN away as fast as you can. This dentist it the worst. He is a hypocrite. He had me come in for an appointment, I was there for about two hours and nothing was done. The girl that was to clean my teeth did not even work there, or so she told me. It makes one wonder what kind of business the good old doctor is running. I stated to the person that made my appointment that I had already had x-rays done and to my knowledge I was only covered for one set per year. During my visit, and in front of other people another girl comes back to where I was being 'treated' and starts talking out loud about my medical insurance. Can anyone say HIPPA violation. At that time I interrupted her to ask her to repeat what she has said and restated what I was told about my insurance. She then asked me if I thought that the insurance people were wrong. I simply said that I was told otherwise. In the end I had said x-rays and the dentist that I had only talked to a total of two minutes comes to me and tells me that we are not a 'fit' and then when asked what he was talking about he refused to answer. I was extremely offended and hurt. He basically threw me out of his office. I still do not understand what happened. I was not rude to anyone and they were to me. This office is very unprofessional and one I would avoid if I were you. So instead of telling me that before he ran the x-rays he told me after they had already been completed. He is corrupt and dishonest. He never had any intention to treat me so he should never had run the x-rays. One of the excuses he made was that I canceled one appointment due to a migraine caused by my disability. So I am also lead to believe that this doctor is also prejudiced. This dentist is rude, mean, and very arrogant. I would not trust him with a flea much less anything of importance. The way that I was treated in his office was reprehensible.